A few months ago, I decided to pick up an HP Omen laptop for mobile productivity and gaming. The laptop came with a generic HGST (Hitachi) 7200RPM 1TB hard drive which just won't cut it. I decided to upgrade the primary drive with an M.2 SSD and needed something with bulk storage that was budget friendly. Here enters the Seagate FireCuda 2.5 SSHD that is promoted as both gaming and productivity focused. The drive comes in a max size of 2TB, and I opted for the max to support multiple games, and multimedia enabled projects for BenchSpotter. The 2.5-inch drives come in three options: 500GB (ST500LX025), 1TB (ST1000LX015), and 2TB (ST2000LX001). The drives come with an embedded 8GB NAND that promises to enhance Gaming, Application, and Operating System performance across the board. Seagate promises 140% Faster / 50% Faster, 450% Faster / 300% Faster, 35% Faster / 25% Faster respectively for each category compared to common 5400 and 7200 RPM 2.5 inch hard drives on the market. 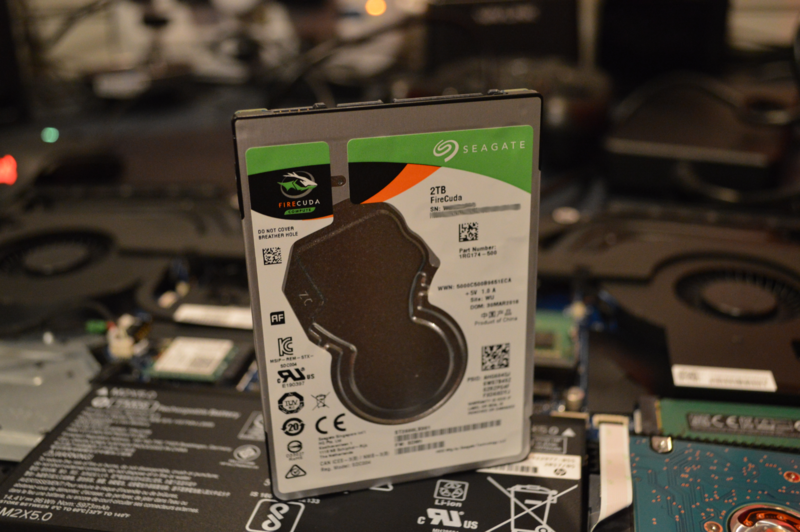 Each model comes with a SATA 6Gb/s interface and a 5-year warranty from Seagate. All models of the FireCuda drives promise the same transfer rates of up to 140 MB/s and operate at an (unpromoted) spindle speed of 5400RPM. For this test, I copied a large video file (12GB) from an M.2 SSD to the FireCuda 2.5-inch 2TB drive. This test produces consistent results for expected write capabilities of large files onto the SSHD. The second part of this test is meant to measure read performance. Once the large file had been copied to the FireCuda SSHD, I performed another copy back to the M.2 SSH drive from the FireCuda SSHD to measure max read capabilities. I used the M.2 SSD drive to eliminate read and write throttling for the copy action. I've included two popular games that are known for their loading screens and loading time. A full system reboot was performed between testing to ensure no OS or system cache would impact loading results. Honestly, the results seem to be a mixed bag. The Seagate FireCuda drive appears to deliver on the promise of productivity improvements with it's SSD embedded storage but suffers in some write and read tests. I think it's important to keep in mind this drive is 5400RPM compared to the 7200RPM HGST Travelstar drive. This means it creates less heat, noise, and pulls less power than the HGST drive. Overall, I'm impressed that this SSHD drive was able to compete with the generic HGST 7200RPM drive for read and write capabilities. Given the price tag of $91 (US), it seems like a great deal considering the performance, lower heat, noise, and power usage. If you are looking for an Xbox, PS4, Laptop, or an external 2.5-inch drive, the Seagate FireCuda has a lot to offer for the price.